Are you sitting comfortably? Probably not if you’re at The Viaduct Tavern. This fortuitously located corner pub is undoubtedly rather good but bugger me is it short on places to park your posterior. Fortunately pubs are one of the few places it’s fine to stand up and enjoy your drink. If you did this in a restaurant or a tea room you might look like you’d lost it but take my word for it you are fine to do this in a pub and not get funny looks or sectioned. Lack of seats aside this is pretty decent. A pub steeped in history is usually a winner in my book and this is no exception. 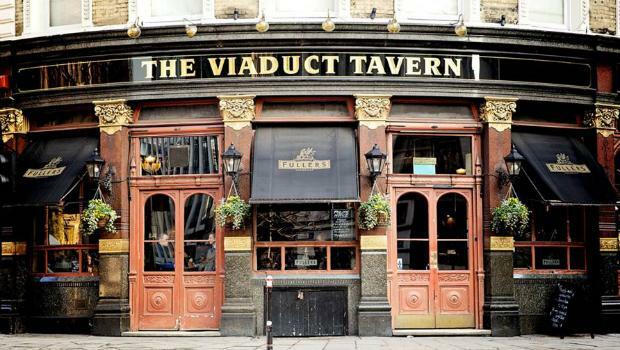 You’ll find the pub directly opposite the Old Bailey and only a short trot from St Pauls. It’s situated on the site of a former jail and there are supposedly some cells still in the basements levels but these are disappointingly not open to public viewing. In another life this was a gin palace and it bears all the hallmarks of Victorian opulence and extravagance in its decor (see The Princess Louise and Princess Victoria for other good examples of this). If you are lucky enough to get sat down there is a food on offer – the pubs website alludes to Smithfields meat market close by and if the other local Fullers pub ‘The Butchers Hook and Cleaver’ is anything to go by then it’s be fresh and very high quality. Be aware though that it isn’t on offer all the time. Booze is what you’d expect from Fullers with London Pride as standard an a smattering of options from the rest of their range; I’d suggest ESB or Honey Dew personally. In honesty this is noting to rave about, it’s certainly one you ought to tick off if you’re keen to visit some of London’s historic pubs but it’s not much more than that. A swift after work pint ought to suffice here just to say you’ve been. I’d like to say it’d be a decent pub to drop into when mooching around St Pauls and Cheapside but it’s closed at the weekend. I’ve run out of things to say. Review done. Next!